This is separated sell of 120 Warm White & 120 Multicolor Fairy Lights. This JIngle Light Mini string lights are made with high quality LEDs and wire that give off warm and magical light to create a romantic ambiance for your room, wall, patio, balcony. The waterproof design is suitable for indoor and outdoor decoration. The batteries operated and soft green wire can face all your need. You can hang them any place you like, for your bedroom, home , kitchen, garden, patio, yard, fence, tent,etc. And the string has an 8 flashing modes: comb, in waves, flashing, all flashing, chasing flash, slow fade, twinkle, steady on. 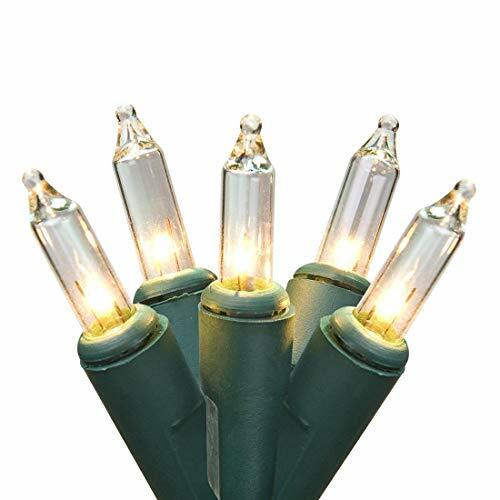 The hottest thing in holiday lighting is the simple LED. LED consumes one quarter power less than traditional incandescent lights. You'll be the envy of the block with thousands more bulbs than your neighbors and only half the power bill. LED bulbs will last for many years with their 50,000 hours lifespan. You needn't worry that strands will turn out in the middle of the holiday season. A fantastic Xmas decoration that will look great in your home or office. Battery operated: Use 3 x C size 4.5V ( not include) with waterproof box. Portable, safe and easy to use. One batteries set can last nearly one month,even you use them everyday. 8 modes with a timer: The button switch with 8 flashing modes adds more different direction effects. This string has a timer control function, which will be 6 hours "ON" and 18 hours "OFF" automatically. Waterproof: The entire party fairy string is waterproof. Great for indoor and outdoor. These lights are suitable for using in conditions where dust, rain, spraying water, snow or forest exist. Save energy: The high quality LED chips, helps you to save most of energy. LED chips are very durable. Use widely: Add warm and charming atmosphere for your party decoration, patio, balcony, lawn, porch, yard, fence, bedroom, staircase, gate,tent, camp, BBQ, wedding. If you have any questions about this product by Jingle light, contact us by completing and submitting the form below. If you are looking for a specif part number, please include it with your message.